We Tried Real-Time Rendering. Here's What We Found Out. You may already know what Fortnite is, and by extension, you may very well know what Unreal Engine is, too. If you don’t, here is a quick summary: it’s a game engine and development platform that is capable of all manner of real-time rendering, physics and game mechanics design tasks, as well as one of the most popular game engines ever, having been used to develop legendary titles such as Unreal, Deus Ex and, most recently, Fortnite itself. The environment of Unreal Engine is not just for gamers, though. Indeed, for a long time, people from many different fields have used Unreal Engine to communicate product visualization to customers. 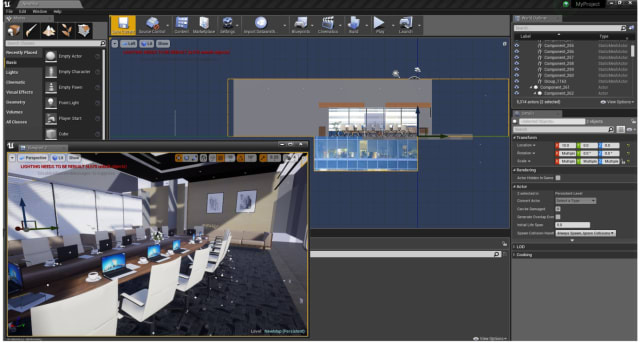 Unreal Engine allows product designers and architects to not only show a product or architectural design, but also allows them to walk through the scene and interact with it. The addition of virtual reality (VR) capability now adds an even greater depth of immersion. But in the past, those wanting to integrate Unreal into their design and presentation work have generally needed to rely on third-party plug-ins and workarounds in order to import models from their chosen CAD platforms into Unreal. Just recently, however, Unreal has released Unreal Studio for the latest version of its game engine, which promises to streamline the workflow for creating real-time rendered interactive presentations. Much of this streamlining effort is enabled by the Datasmith toolkit, which allows for relatively easy importing of non-native CAD files. Recent plug-ins for Datasmith include an export tool for users of 3ds Max and SketchUp, which allows files to be converted and exported into Datasmith files from within both of those respective software programs. During conversion, geometry, materials, lighting data and CAD file structure are saved and transferred, making them ready for viewing in Unreal. The video below shows a real-time rendered scene in Unreal, which had been converted from 3ds Max into a Datasmith file. Without Unreal Studio and Datasmith, this complicated scene would have taken four weeks to convert and clean up manually for rendering in Unreal. With Unreal Studio and Datasmith enabled, it took just one day. Another advantage of using Datasmith for importing CAD files is that the software will ensure that the original CAD structure is maintained. As a result, all of your product hierarchy and structure will be maintained on import into Unreal, as will the original relative locations of any parts in an assembly. If you are an engineer and you are unfamiliar with how Unreal Engine can help you communicate your products, then rest assured, you can make some nice graphics with this software—that’s coming from an engineer who has never used Unreal before. And it’s free. But there may be a little bit of a learning curve if you’re more accustomed to your own chosen CAD/rendering/visualization software. Engineering.com previously spoke to Marc Petit, general manager of Unreal Engine Enterprise at Epic Games. Take a look at the following video to see how Datasmith and Unreal Studio is bringing real-time CAD to the engineering masses. We installed Unreal Studio to try for ourselves, and now we’re going to talk you through the experience. Feel free to install it for yourselves and see what it’s all about. First up, you need to sign up for the free beta version of Unreal Studio, download Epic Games Launcher, and then install the latest version of Unreal Engine, which is currently v4.20.1. Then, from the launcher, you need to install your required extension (for 3ds Max or SketchUp) as well as a Datasmith plug-in for Unreal Studio. You can find full installation instructions here. Once all the software is installed, you can click on the Unreal Studio tab on Epic Games Launcher, and select the Unreal Studio tab, as seen in Figure 1. Figure 1. Epic Games Launcher. Once you’ve opened the Unreal Studio tab, you can take your pick of options. You can either open up a new project with the Unreal Studio control defaults loaded, where you can load your own CAD models and build your own presentation, or you can select Product View, and view the demos for yourself. At this stage, you might like to see what Unreal Studio can do before you jump in at the deep end. You can do this by selecting Product Viewer, which will let you see the prebuilt presentation that is included. In this instance, the demo shows some kind of gear assembly, as shown in Figure 2. Look at it—all shiny and rendered in real time. If you move the camera around, the object is rendered before your very eyes. Figure 2. Product Viewer demo. If you run the stand-alone executable or the game simulation, you can manipulate the gears as you would “in game.” This allows potential customers to view the product from a variety of angles, or make certain components explode or become invisible. It’s basically a virtual showroom demo…and Unreal Studio allows you to import your CAD files and set up your views, as well as guide the customer’s eyes where you want them to focus. You can add various hotspots and viewports to allow a customer to follow the narrative that you have set. And it’s all rendered in glorious real time—like a video game. We imagine this demo would look great with an HTC Vive, and using those little hand controller devices would add a new dimension of immersion, especially when it comes to manipulating the parts. But we don’t have an HTC Vive handy…so never mind! We took a while playing with the settings behind the demo, just to see how changing certain parameters affects the scene. You can spend a few minutes to do the same, if you are unfamiliar with Unreal Engine. The engine will allow you to select your lighting, models, textures, viewpoints and camera angles/paths, much like you’d expect from a 3D animation platform such as Cinema 4D. The beauty of Unreal Engine is that it was designed for video games, and so the whole platform is well-suited for walk-throughs at eye level. This is especially useful for architects, who must convey realistic immersive scenes to their customers. For an example of architectural renderings and fly-throughs, you might want to download the Epic Zen Garden demo from Epic Games Launcher, which will give you an idea of how to build a presentation narrative for architectural clients. It’s recommended…the rendering is very good, and shows how demos can be tailored for maximum interactivity. In the Zen Garden demo (see Figure 3), click on the branches of the tree near the pool, and watch the flowers bloom to life! Figure 3. Zen Garden architectural presentation. See those two white circles in the graphic of Figure 3? If you click on those while the demo is loaded, your viewpoint will be changed to the location of the circles, at a predefined view. The static image shown in the figure really doesn’t do the presentation justice. OK, demos are cool. They show what the artist and the technology is capable of doing, as long as the artist knows what they’re doing! But what if you’re like us and have no idea what you’re doing but still want to see the workflow in action? To test the SketchUp file export, and see how easy it was to generate awesome results like those shown in the demos above, we borrowed a 3D model from a friendly architect. The model already included textures and lighting applied in SketchUp. So, how much of this information would be saved during the transfer to Unreal Engine? By installing the SketchUp plug-in/extension, we were able to export 3D models and scenes from SketchUp as Datasmith files from the SketchUp export menu. In our test, we performed that very task, and waited for a moment while SketchUp offered to fix the geometry before exporting the Datasmith file. The file was exported fine, and then was imported into a fresh Unreal Studio project. The immediate results are shown in Figure 4. Figure 4. Test import from SketchUp. Obviously, this is not exactly how the scene was envisioned in SketchUp. There are some lighting errors, and the powerful Unreal Engine calls us out for using low-resolution textures by casting beams of light onto our badly textured furniture. Note to self: If you want the best results, use the best components. Materials and textures designed specifically for Unreal are available in the Epic Games Launcher store. Suffice to say, they look excellent. So, the export/import Datasmith functions work fine, but you may need to perform a little manual clean-up if you’re designing scenes in another platform before you import files into Unreal. For engineers, perhaps, the SketchUp and 3ds Max plug-ins may be a little redundant. In the case of an engineering project that doesn’t use export file plug-ins, it may be best to just import the raw geometry into Unreal Studio, and then apply lighting and materials/textures from within Unreal. That said, there are over 20 types of CAD files that are accepted for import into Unreal Engine. Perhaps some work better than others? 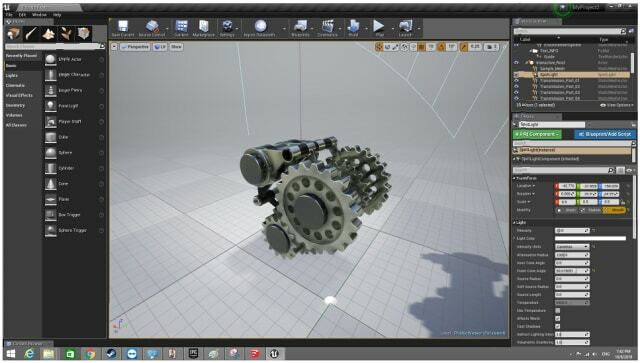 Test your own preferred CAD format in Unreal Studio and see what works best for you. Bear in mind, Unreal Studio is still in beta, and so there may be a few bugs to work out before the export/import works perfectly. Epic Games also has an active forum where they actively solicit feedback on the beta, so feel free to browse others' questions and participate in the process. Unreal Studio is clearly aimed at architects and product designers, and according to one survey of architectural visualization specialists, 20 percent of the 2,000 people polled said that they already use Unreal Engine for visualization. So the architects love it. But why would an engineer want to use this software? The real-time renderings are beautiful, the effects are neat, and the control system is…well…like a video game. So, it’s easy to navigate and move your models around. Another appealing feature—for those who really want to utilize the full power of the Unreal platform—is that scripting is allowed in Unreal. 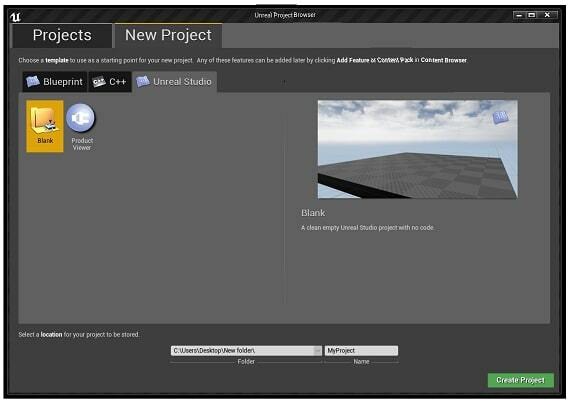 Users who want a higher degree of customization than is available in the Unreal Studio templates can use Unreal C++ or Blueprints Visual Scripting to create game and visual elements. The engineers who will get the most value out of Unreal Studio are likely the ones who already have experience with the Unreal Engine and are working for a company that is willing to embrace new workflows and ideas. The best advice we can give is that you download the beta for yourself, and see how comfortable you are working with Unreal Engine. 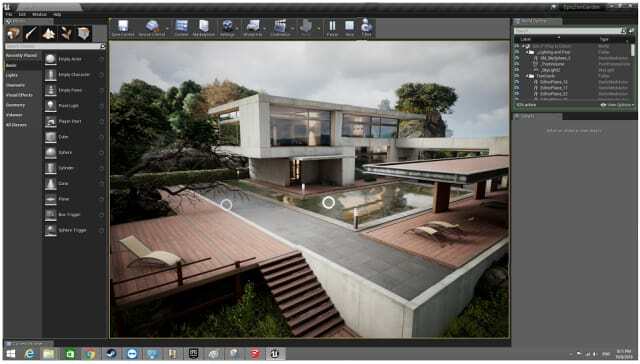 We are definitely impressed with the software’s awesome graphics and presentation abilities, but you’re going to have to be prepared for a fairly steep learning curve if you’re not already familiar with Unreal Engine. Fortunately, the Unreal Engine Online Learning platform was recently launched, which should make the learning curve much easier to traverse. All in all, we’ll be very interested to see if Unreal publishes some case studies from the engineering sector to demonstrate how non-traditional customers outside of architecture are making use of real-time rendering in their presentations. And we will share those stories right here, when we hear about them.